The glow-in-the-dark retro stripe lanyard straps consist of woven-in purple, neon green, yellow, purple, hot pink, yellow, dark green and glow-in-the-dark stripes. The glow-in-the-dark big stripe is located in the center. 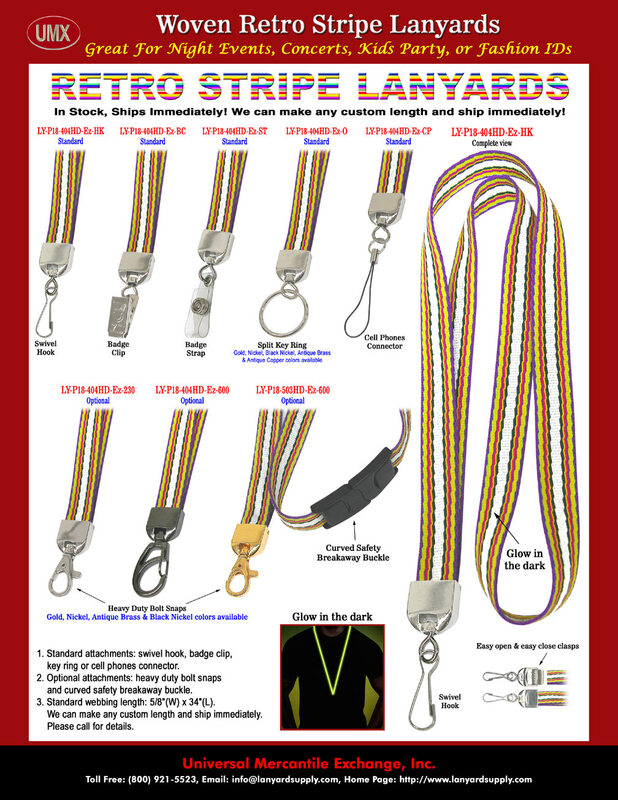 Not only are the retro stripe glow-in-the-dark lanyards designed for others to locate you easily in the dark, but they also give you extra safety protection. You can buy glow-in-the-dark neck ID lanyards as small a quantity as one piece for your personal use or as a sample order to test it out before you purchase a larger quantity . Custom imprinting on the retro stripe lanyards are not recommended due to the small printable area! You are viewing Lanyards > Glow In The Dark > 5/8" Cool And Uniquely Designed Glow In The Dark Series: Woven Retro Stripe Badge Holder Neck Lanyards.